Device to device communication is an advanced data transmission technology developed to increase the efficiency of network. 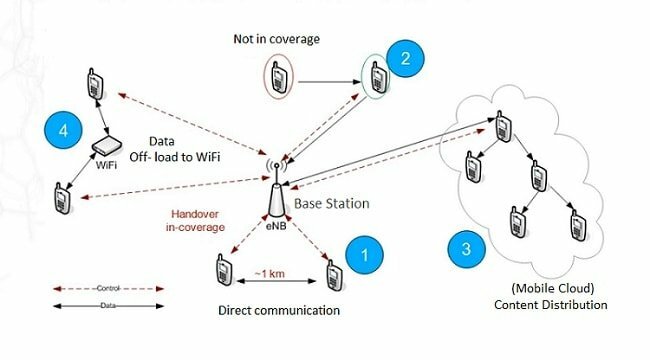 In LTE -Direct, D2D communication enabled devices can interact each other using a secure transmission protocol similar to the devices communicate with the base station. In order to have a stable communication and uninterrupted service, mobile devices must be within the proximity of base station. Proximity doesn’t only refer to physical distance, often referenced as signal strength received at mobile device (UE). Due to higher interference from surroundings and sometimes due to signal blocking physical structure like concrete walls or locations like basement, received signal strength would be lower than required. Device to device communication technology is a best solution to improve the signal proximity scenario. If any device is connected to the mobile network, it can act as a relay station to other device(s) not under direct proximity of base station to establish a connection to the core network. How does D2D communication works? Device to device communication can be achieved in multiple modes of operation depends on the scenarios. According to the situation, most suitable operation mode will be chosen to establish efficient transmission. Scenario 1: If two devices are in proximity they can start communication like sharing data. This helps to improve data rate, reduce power consumption of devices and total load reduction of base stations. The control will be handled by base station. Scenario 2: During the absence of an active mobile network connection or insufficient signal reception, D2D enabled devices can establish an alternative communication interface with its surrounding devices which are connected mobile base stations. It will help the node with no coverage to maintain a connection to the mobile network. Scenario 3: Multiple devices can connect to a device which has an active connection to base station and further extend this network with adding connection to more devices. All devices in this small mobile cloud will receive same data in the form of advertising or messages from the source. Scenario 4: In this case, multiple devices are offloaded to Wi-Fi data connection for communication. Control signals to devices (UE) will be handled by the base station. Wi-Fi offloading offers much higher data rate, less power consumption and avoid traffic overload of base stations. Other Scenarios: Device to device communication can be efficiently implemented for machine to machine communication where each machine can talk to other machines in its proximity. D2D communication is used in vehicle to vehicle communication and peer to peer communication applications in the same way. All these cases, one node will connect to main base station (transmitting station) and other devices form a small network to communicate each other. Device to device discovery: responsible for physical proximity, signal to noise ratio, delay, density and load. Device to Device communication: it initiates communication between devices under its proximity. Infrastructure Service Discovery Study Group: centralized protocol for WLAN network based on Point Coordination Function (PCF) access mechanism. Complex algorithms required to efficiently handle devices without interference. Signal transmission power to a particular device need to be increased from base station to overcome surrounding interference. 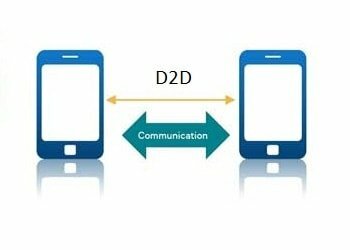 D2D communication is a proximity based protocol, thus distance between devices are limited due to power requirement. Device compatibility and network capability is necessary to support D2D protocol. Despite the fact that D2D communication effectively improves the network efficiency, it also raises concerns about security and privacy. High level encryption techniques and transmission protocol has to be implemented to protect information concerning users. 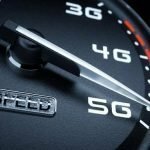 Device to device communication is one the effective ways to improve network efficiency and suggested technique (LTE-Direct) to offload base station traffic in LTE advanced and future networks. D2D communications are significant in applications like self driving cars, machine to machine communications and other internet of things applications. 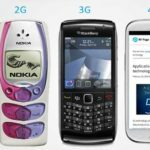 5G technology will make use of D2D communication for wide range of applications. Internet of Things will connect billions smart things (devices and sensors) to internet. D2D communication can be implemented in IoT applications for low power mesh networking and smart sensor clouds. Mission critical application is one of the most significant applications of D2D communication. During an emergency situation, network availability might be limited or unavailable. D2D communication enables users to connect to nearest devices and interact each other even during absence of a mobile network.